A feature in two volumes. Situated in Mexico, the Museo Frida Kahlo receives approximately 25,000 visitors each month. The eponymous artist who used to call it her own Casa Azul has garnered much posthumous admiration, becoming a pop culture icon, earning tributes ranging from BuzzFeed listicles to scholarly essays. Although the artist is commonly lauded as a feminist, her art is also characterized by a quintessential consolidation of humankind and nature. One that plays a formative part in this relationship’s development in contemporary art. 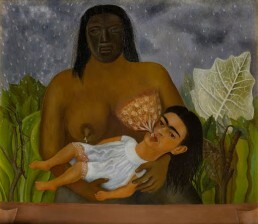 Kahlo demonstrates a synthesis of ancient and current, as well as foreign and native, dissolving categorical binaries such as geopolitical boundaries and human-vs-nature stereotypes so that the image of the earth in her paintings transcends those distinctions, coming closer, perhaps, to reality. The effect this can have on viewers is quite advantageous in what the writer J. Edward De Steiguer would call the Age of Environmentalism. The proliferation of Kahlo’s ideas has been accelerated by the advent of the internet. Frida Kahlo’s spirit has seeped into meme-culture and a myriad of easily-accessible online biographies and analyses. In addition is the less trackable artistic influence she has exerted and continues to exert on countless graphic artists, fashion designers, students, and even gardeners. Of the celebrities who have professed their admiration of Kahlo are the punk poet Patti Smith, who wrote a poem in response to her visit to La Casa Azul, and Florence Welch, whose song Various Storms and Saints borrows a line from a poem dedicated to Kahlo. Any further discussion of this topic merits a detailed foray into certain segments of the artist’s biography and an analysis of some significant case studies. In 1907, about 51 years before La Casa Azul was opened to the public, it saw the birth of Magdalena Carmen Frieda Kahlo y Calderón to Guillermo Kahlo and Matilde Calderón y González. In My Grandparents, My Parents, and I, the dwelling acts as a pot for the infant Frida’s family tree, and the various features of the landscape behind the floating figures of her grandparents allude to their ethnic backgrounds. 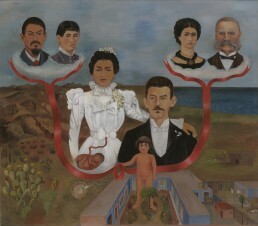 Her father’s parents are positioned above the sea, referring to the fact that Guillermo -or Wilhelm- Kahlo was a German Jewish immigrant from across the ocean. Meanwhile, her mother’s family sits above some mountains and cacti, since she is native to Mexico. In the piece, Kahlo uses her natural heritage to express her cultural and ethnic identities. The painting gives valuable insight into her relationship with the mestiza nature of her familial, racial, and cultural provenance. According to Amy Stechler’s biographical documentary, The Life and Times of Frida Kahlo, Frida “wanted to study […] biology, zoology, and anatomy, and hoped ultimately to become a doctor” while growing up. Though juvenile in nature, these ambitions, along with her jovial spirit and “immense joy in living”, could indicate Kahlo’s deeply personal love of nature and life. In an interview with Carlos Fuentes, the writer said that he saw Frida as a “pantheist” who “was in love with the world. In love with everything that was alive: her love for the little dogs and the flowers and the monkey and all things that appear in her painting. She sort of sacralises the world; she sacralises everything she touches. She’s in love with the world as a garden.” Indeed, even well into adulthood, this attitude remained a defining factor of Kahlo’s identity and is evident in the interior and exterior design of her house, which bustled with life of many kin and kith. Kahlo’s house, La Casa Azul, where she was born and ultimately died, played a pivotal role in establishing or manifesting –or both- Kahlo’s relationship with the natural world. In it, Frida kept her collection of “botanical field guides, books on Mexican medicinal plants, […] a copy of an illustrated herbal handbook […] which provides first-hand descriptions of the plants used by the Aztecs”*, and an edition of Walt Whitman’s anthology, Leaves of Grass, as is described by Lucy Davies for The Telegraph. Following their marriage, muralist Diego Rivera and Kahlo would redecorate and metamorphose the latter’s home into what is deemed by many as a remarkable part of her oeuvre: the garden of La Casa Azul. Prior to the renovation, with its “neo-classical European elements”, the Kahlo household had a “19th century taste for ferns and palms”, according to Davis. The house, regardless of its domestic design, was located in the suburban Coyoacán which boasted a plethora of green attractions, including parks and tree nurseries. In 2015, their garden would be emulated in an exhibition by the New York Botanical Garden. The historians and horticulturists who worked on recreating the verdant courtyard faced the challenge of arranging specimens of “Jacaranda, oleander, philodendron, […] and many varieties of cacti and succulents”* into a New York exhibit space the way that Kahlo might have in her Mexican orchard. The exhibition’s curator and author of the accompanying book, Frida Kahlo’s Garden, said that she “[thinks] of it as an environment that nurtured [Kahlo’s] creativity”. Indeed, and especially towards the end of her life, Kahlo painted a number of still-life works derived in subject matter from her garden and local market. The largest of these, Fruits of the Earth, exemplifies the precision and effort Kahlo devoted to representing motley fruits and vegetables, as well as the sexual undertones which pervaded most of her paintings thereof. 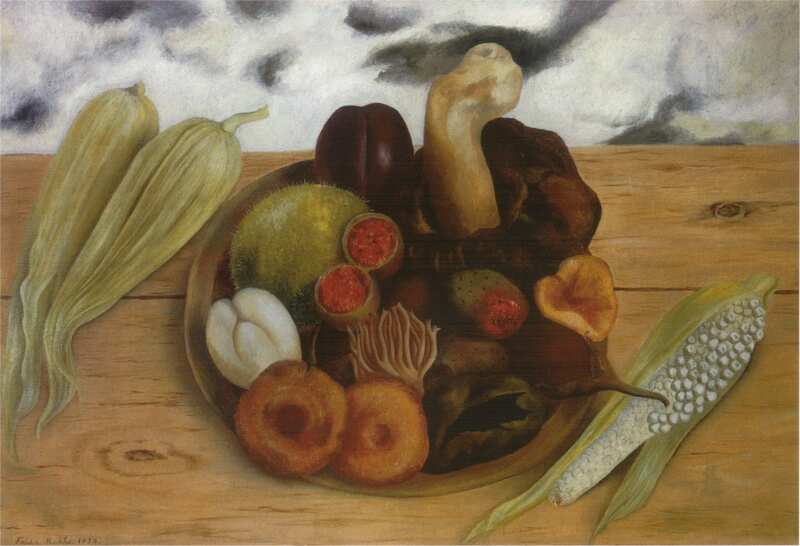 Her Still Life of 1942 was even rejected by its commissioner, the First Lady of Mexico, for its implicit eroticism, which Hayden Herrera, Kahlo’s chief biographer, describes as representing “a drama of higher reach”*. Looking beyond genital innuendos, as Herrera may have, one may find that the fluid composition of Still Life echoes the flux of Kahlo’s own sexuality, and that its exotic harmony embodies, perhaps, a pinnacle of psychosexual development which Kahlo failed to reach due to her infertility. 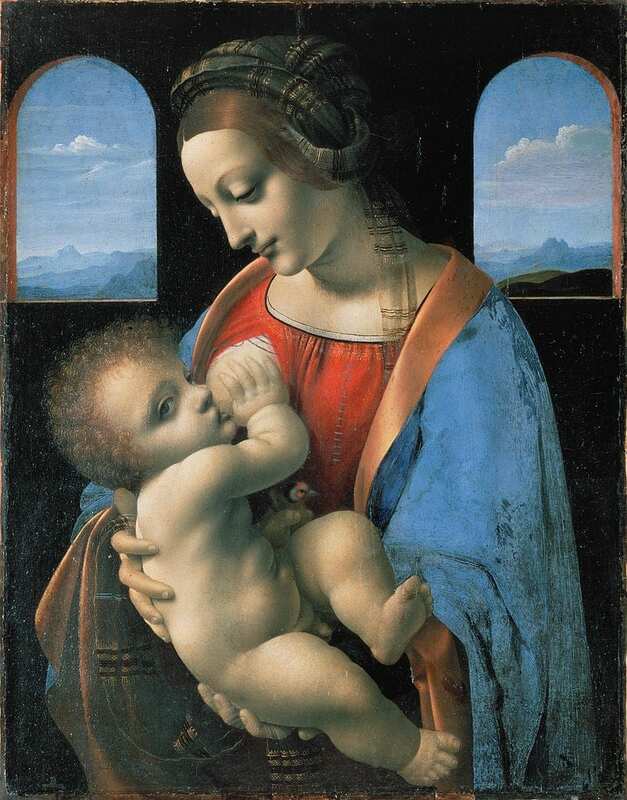 However, because they are more renowned, and because their inclusion of a human figure appeals to the unconsciously egocentric dispositions of most viewers, her self-portraits are of a greater gravity when it comes to solidifying a human-nature relationship. Many of these featured the multifarious fauna which inhabited La Casa Azul. The Rivera’s shared their home with “parakeets, macaws, hens[,] sparrows”*, spider monkeys, Amazon parrots, a fawn, an eagle, and a pack of ixquintle dogs, a hairless Mexican breed. From one perspective, the act of sharing her living space with animals emanated from her general love thereof, while, from another, it may be theorized that most of her pets acted as surrogates of the children she could not conceive. A third point of view could, further still, posit that her nurturing of animal companions as if they were her offspring bolstered her love for fauna –and nature in general- by driving a very intimate connotation into all lifeforms she was exposed to. Additionally, the power couple obsessively collected Meso-American artifacts and habitually visited the “‘floating gardens’ of the Aztecs, […] a series of shallow lakes and canals that ran through […] thick vegetation”, in Davies’ words. The couple’s appreciation of Aztec culture sprung from their indigenismo, a political stance which sought after the revival of Mexico’s indigenous cultures. This sentiment underlies most of Kahlo’s work as well as her bond with nature. The celebratory nativism of the movement burgeoned after the Mexican Revolution, when Kahlo’s adolescence made her especially susceptible to adopting it. Contemporaneous educational reforms sought to forgo the largely European façade Mexicans had adopted during the Porfiriato and conceive a culture which was more genuinely Mexican, reintegrating indigenous traditions and arts into the mainstream to establish a new –but old- national identity. The pre-Columbian principles exhumed shared a fundamental belief in the intrinsic connection between humanity and the natural world, and Kahlo took hold thereof with full force. Aside from her high-school curriculum, Kahlo was part of a gang, Los Cachuchas, whose members, aside from flabbergasting their teachers with subversive hoaxes, created an intellectual environment for themselves which fostered debate and thought in religion, politics, and philosophy, cementing her Mexicanidad and Marxism. Though such details may seem like trivialities, they were likely formative aspects of “the zeitgeist of Frida‘s time”, one which “[highlighted] the indigenous past of Mexico and its pre-Columbian history”, according to Stechler’s documentary, and fermented what Western scholars tend to classify as the Mexican Renaissance. In other words, Kahlo’s politics largely informed the relationship with nature she expresses in her paintings, and this relationship’s intensity was proportional to her political zeal and interest in folklore and myths. With this in mind, the analyst is provided with a mythological lens through which to view Kahlo’s work: the monkeys in her self-portraits hence become more than child-substitutes, chaperons, and even aspects of her identity –they also become symbols of lust and “patron[s] of the dance”, as Andrea Kettenmann explains in Kahlo. Her art becomes a complex collision of contextual elements ranging from the personal to the historical, and it is refined even more by the fact that her life was a point of interaction between pre-Columbian and colonial artistic traditions, specifically the folkloric art propagated in the 1920s and the “votive paintings of Christian saints and martyrs which have a permanent place in popular religious belief”. As such, the maternal bond between Kahlo and nature, as is expressed in My Nurse and I, is a synthesis of the “representations of indigenous mother goddesses and […] the colonial, Christian motif of Madonna and Child”, according to Kettenmann,, thus imparting a more effectual impression on viewers within a wider demographic. Kahlo had an impressive collection of the said ex-votos, and her mother was a devout catholic; this probably makes the claim that she borrowed from the conventions of Christian iconography more plausible. 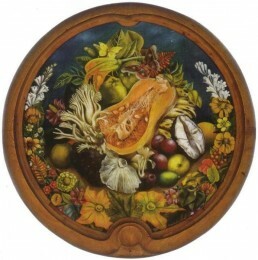 The small paintings on metal were meant as offerings of gratitude to Saints, but it is clear that Kahlo had other intentions in her own renditions. My Nurse and I is both an example of how the artist married between mythologies and how she incorporated the earth into her works. Adapted from an IB Visual Arts Extended Essay. 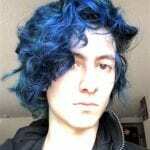 One thing I’d really like to say is the fact that before purchasing more personal computer memory, consider the machine within which it could well be installed. In case the machine is usually running Windows XP, for instance, a memory threshold is 3.25GB. The installation of in excess of this would easily constitute some sort of waste. Make certain that one’s mother board can handle the actual upgrade quantity, as well. Good blog post.